The availability of mortgages is expected to fall further in the next three months, lenders have told the Bank of England. Lenders say they will put a further squeeze on the availability of home loans in July to September, the Bank's Credit Conditions Survey says. They also expect the number of people who default on mortgages to rise. The amount of unsecured lending, such as overdrafts and credit cards, is also expected to fall. The Chancellor, Alistair Darling, has been meeting the heads of the major UK banks along with US Treasury Secretary Hank Paulson. At a press conference on Thursday, Mr Darling made it clear that there was little the government could do to review the mortgage market while the wholesale credit markets remained frozen. Mr Darling said that with one-third of all mortgage lending having previously been funded by wholesale borrowing, the number of mortgage loans was bound to fall. He said he remained hopeful that in the longer term, the extra lending that the Bank of England was providing to the financial sector would bear fruit - but it very much depended on the restoration of international confidence. In the meantime, the government would try to help homebuilders by allowing social landlords such as housing associations to buy unsold new private sector homes. But he pointed out that the UK had far fewer of these than the US. The Bank of England survey asks lenders to gauge what they have experienced in the previous three months and what they predict for the following quarter. A significant factor in the tightening of the mortgage market over the past three months was the fact that lenders expected house prices to fall, the Bank said. The Nationwide Building Society, one of the UK's biggest mortgage lenders, reported its eighth consecutive monthly fall in house prices this week. 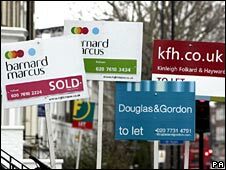 But the Bank of England predicted that the demand for home loans was also expected to fall in the coming three months. It fell by more than lenders anticipated from April to July, the survey revealed. The number of people defaulting on their mortgages also rose by more than lenders had expected in the past three months, the Bank said. There was more bad news for first-time buyers without significant savings, with mortgage suppliers expecting to ask for bigger deposits in the coming months, instead of putting up the cost of a mortgage. Banks and building societies have regularly pointed to the cost of borrowing from each other during the credit crunch as the main factor behind the falling availability of mortgages. Fewer than 4,000 different types of mortgage are now on offer, compared with more than 11,000 a year ago and the cost of these deals has been fluctuating for months. In its survey, the Bank found that a balance of plus 55% of those lenders asked believed that expectations for house prices had affected overall mortgage availability during the past three months. A balance of plus 69% considered that it will be a factor in the next three months. This compares with plus 38% who believed tighter wholesale funding conditions affected availability in the past three months, and plus 39% who identified wholesale funding as an issue for the next quarter. The outlook is also looking tough for small businesses, with a reduction in corporate credit availability predicted for the next three months, and default rates on loans expected to rise. Earlier in the week, the Bank reported that the number of new mortgages approved for house purchases had fallen to its lowest level since figures began in 1993. Some 42,000 home loans were approved in May, a 28% fall compared with the previous month and 64% down on a year ago. The following day, the Nationwide said the annual house price fall in June was 6.3%. This means the average home costs £172,415 and is £13,629 cheaper than at the top of the market in October last year. "Along with news that service sector activity contracted in June, tighter credit conditions heaps pressure on the Bank of England to hold off from raising interest rates despite current elevated inflation levels and risks," said Howard Archer, chief UK and European economist at Global Insight. Borrowing limits on people's credit cards are likely to be cut further and lending criteria for non-credit card debts, such as overdrafts, are also likely to be tightened, the survey showed.